Mexico proved too sharp for World Cup holders Italy by beating them 2-1 in a warm-up match on Thursday for this month's tournament in South Africa. The world champions, whose previous match was a 0-0 draw with Cameroon in March, started brightly with Vincenzo Iaquinta heading against the bar in the third minute, but the harrying Mexicans then took over with far neater play. The lively Giovani Dos Santos found Carlos Vela unmarked in the Italian penalty area and the Mexican striker comfortably scored in the 16th minute. Veteran Cuauhtemoc Blanco chipped over the Italian defence for Alberto Medina to settle the match in the 83rd minute. Substitute Leonardo Bonucci pulled one back for Italy in a goalmouth scramble three minutes from time. "I don't think we could have met a worse team today," said Italy coach Marcello Lippi, explaining that his team had only just completed 10 days altitude conditioning and were not fully match fit. "There are no alarm bells... We need to get fit gradually and peak at the right time. It's true I expected to see us better prepared physically," he told a news conference. "I know these players very well, I'm not sad at all. It's important to be in the right condition in 10 days or so," he added. Italy, who take on Switzerland in their final friendly on Saturday, start their Group F campaign against Paraguay on June 14. Lippi plans to give the rest of his squad a game against Switzerland. Mexico, who lost to England and the Netherlands in friendlies last week before thrashing Gambia 5-1, will play the opening match of the World Cup against hosts South Africa in Group A next Friday. Mexico coach Javier Aguirre said his team still needed to work on defence, having let in seven goals in four matches, and should not be complacent after beating the World Cup holders. "The result is less important than what we have shown today. You can see in the changing room. They are serene, quiet and happy with the outcome," he said. "I'm happy with the result, but I think we should be scoring more goals and letting fewer in," he added. Midfielder Bastian Schweinsteiger converted two penalties in four minutes to give Germany a morale-boosting 3-1 win over Bosnia in their last World Cup warm-up game on Thursday. Germany looked sluggish in the first half but substitutes Thomas Mueller, Marko Marin and Cacau added pace after the interval as Germany struck three times in 27 minutes. Cacau, who replaced out-of-form striker Miroslav Klose and set up Philipp Lahm's equaliser, and Mueller, who came on for midfielder Piotr Trochowski and won Germany's second penalty, staked strong claims for starting spots. "In the second half, despite three weeks of preparation, we increased the tempo again and that was good to see," Germany coach Joachim Loew told reporters. "The potential is there. Everyone has worked hard and I think we have a good team, the mood is good in the team and we can play a good tournament," he added. Spain's Jesus Navas scored a stunning late goal to secure a 1-0 World Cup warm-up win over South Korea in Innsbruck, Austria on Thursday, when Cesc Fabregas returned to action after two months out injured. The European champions fielded mainly second-choice players and were restricted to few sights of goal until the closing stages when the substitutes made their presence felt. Arsenal midfielder Fabregas played for an hour without any problems. South Korea produced a well-organised display in their last warm-up game before travelling to South Africa, where they begin their Group B campaign against Greece on June 12. Spain have one more friendly against Poland next Tuesday before starting out in Group H against Switzerland on June 16. 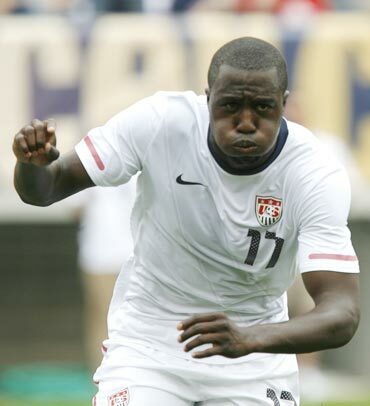 US striker Jozy Altidore missed training on Thursday due to a sprained ankle, the United States Soccer Federation said on their website. Altidore was due to undergo a fitness test on Friday to decide whether he will be available for Saturday's World Cup warm-up match against Australia in Johannesburg. The US begin their Group C campaign against England on June 12. They will also play Algeria and Slovenia.